UNIPART – The nations best known supplier of motor factoring, garage equipment and all makes aftermarket parts has sadly collapsed. Unipart Automotive, a UK-based supplier of car parts and garage equipment, has collapsed with the loss of more than 1,400 jobs across the country after failing to find a buyer. The business, based in Solihull, operates 180 branches around the UK, trading under three brand names – Unipart Automotive, Partco Autoparts and Express Factors. Unipart was originally conceived in 1974 as an “all makes” parts business within British Leyland. Despite the constant upheaval within B.L, Unipart prospered and made good profit. 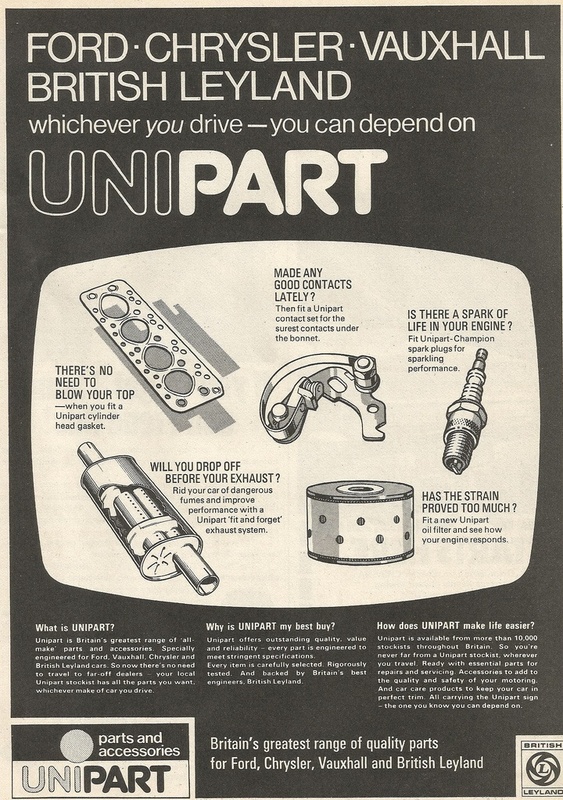 With their well-known slogans including “The answer is yes… now what’s the question?” and “thousands of parts for millions of cars” – Unipart soon became a household name – even branching into reconditioned engines and heavy electrical components under the “Silver Seal” and “Gold Seal” brand. 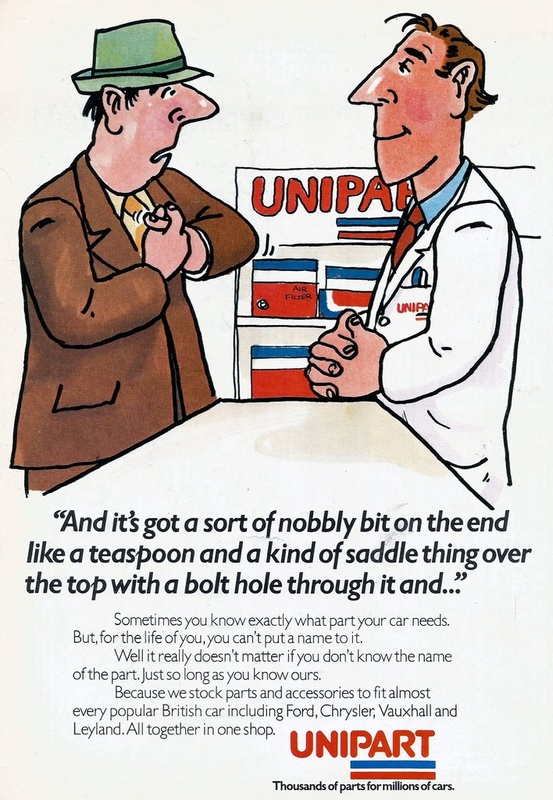 One of the original Unipart adverts – this one dates from 1974. With so many different car and commercial marques all under the B.L umbrella, a simple alpha-numerical part reference replaced all the previous different brand component identification. It was a monumental task to undertake at a time of massive upheaval at B.L, but it worked. Unipart’s first boss was John Egan who became the top man at Jaguar Cars and was Knighted for his services to the motor trade. B.L and Unipart streamlined the whole group parts system and they also re-branded their truck component business into an offshoot – Multi-Part. This featured a state of the art computer operated warehouse in Chorley and following the Governments plan to sell off and privatise B.L, both Jaguar Cars and Unipart were sold to their respective management in the mid ’80s. 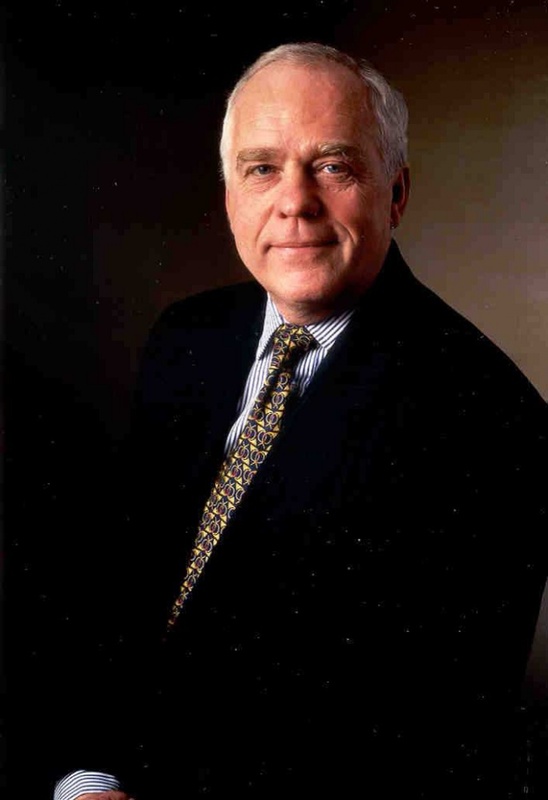 Unipart was originally lead by John Egan. He went on to run Jaguar Cars Ltd which became privatised from B.L Cars in 1984 – he was Knighted for his services to the motor industry. Of the group’s 1,813 staff, 1,244 were made redundant with immediate effect on Thursday. Just over 200 workers have been kept on to assist the administrators, KPMG, but those jobs will also go when the process comes to an end. The remaining 361 staff will transfer to Andrew Page and the Parts Alliance, which have bought 21 and 12 former Unipart branches respectively. Mark Orton, a partner at KPMG and joint administrator, said: “Despite intensive efforts over recent weeks, a sale of the whole Unipart Automotive business could not be reached, and a buyer could only be found for 33 of the sites on a going-concern basis. Roger Maddison, national officer for the automotive sector for the Unite union said the job losses would hurt communities across the country. “This shock news is extremely concerning and will devastate the workforce. It is very disappointing that the company has sought administration and not an alternative buyer. Administration plunges these 1,224 workers and their families into immediate financial insecurity, denying them redundancy payments and putting their pensions at risk. The failure of the business comes at a time of rude health for the new car market in the UK, with growth in both sales and manufacturing in recent months. An industry insider said that although the UK had seen a sharp increase in the number of new cars on the road, facilitated by the proliferation of cheap finance deals, the spare parts market was hugely competitive, with UK firms competing against overseas firms. It is understood that Unipart Automotive found its margins squeezed by heightened competition. A spokesman for the Society of Motor Manufacturers and Traders said the outlook for the UK car market remained strong. KPMG said it was now reviewing the options for the remaining assets of the business, including the potential sale of leasehold interests. Unipart’s stock has already been sold off, leaving a swath of empty units. The accountancy firm said Unipart also supported more than 700 independent, owner-operated garages through its car care centre programme, and 19 franchises. “These companies fall outside of the administration and will continue to operate as normal,” KPMG said. Jovial and vivid adverts like this one from the late 70’s along with their famous calendars made Unipart a by-word and a first call for aftermarket parts and accessories. Oxford based Unipart Group – which operates across the automotive, manufacturing, mobile telecoms, rail, retail and technology sectors – sold a 51% stake in Unipart Automotive to H2 Equity Partners in 2011, retaining an equity stake but no operational control. Unipart Group has written off its stake in Unipart Automotive and was keen to stress that they were different companies. John Neill, the chairman and chief executive of the Unipart Group, said: “We are saddened by the Unipart Automotive situation and even though we sold control of this business years ago, we are concerned for the future of the employees. Unipart Automotive was separate with the exception of some distribution services provided by Unipart Group. The group said that less than 1% of its 10,000 employees provided services to Unipart Automotive, and that those people would be deployed elsewhere in the business. How Bizzare…..as the economy motors ahead, Unipart collapses !